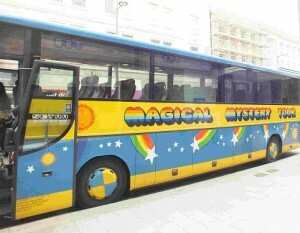 Last weekend we joined Liverpool’s Magical Mystery Tour and set off to discover The Beatles’ history. Along the way we saw some of the childhood homes of all four Beatles, some of their schools, and had photo stops at Penny Lane and Strawberry Field where we heard the stories behind these two songs. We saw the church hall where Paul McCartney and John Lennon first met, and the church yard where Eleanor Rigby is buried. Our guide was excellent – he was friendly and knowledgeable, with several funny anecdotes, but he also showed a great respect for the people who live in the houses near those where various members of the Beatles grew up, ensuring that even though several coach-loads of tourists visit every day, the disruption to local residents is kept to a minimum. The 2 hour tour ends just a short walk from the world famous Cavern Club, where you can usually hear live music being played. We were told our tickets would get us in free for the evening, but we didn’t actually try this. In my opinion the tour is great value for money and a fun way to spend a couple of hours, and I’m not even a huge Beatles fan. For fans of John, Paul, George and Ringo this tour is probably unmissable.